Aylesbury: Southwark finally granted leave to appeal CPO decision. As has been widely reported, Southwark Council finally got permission to make its case against the Secretary of State, for his refusal to grant compulsory purchase powers over Aylesbury estate leaseholders. It was Southwark’s second attempt, after first being flatly refused just before Christmas. There can now be a full court hearing, involving all parties, including the leaseholders, probably some time in April. Southwark Council leader, Peter John, is no doubt relieved by the decision, but he also appears to be confused. The decision does not reverse Sajid Javid’s refusal or overturn the CPO - it just allows Southwark to get on to the playing field, so to speak, and to make its case at a full hearing. In giving permission, presiding Judge Collins said that Southwark and the Secretary of State should first make efforts to ‘ameliorate’ the leaseholders’ situation. Cllr John immediately repeated his call to the Secretary of State, Sajid Javid, to reconsider his decision, through local media without reference to the leaseholders’ plight. 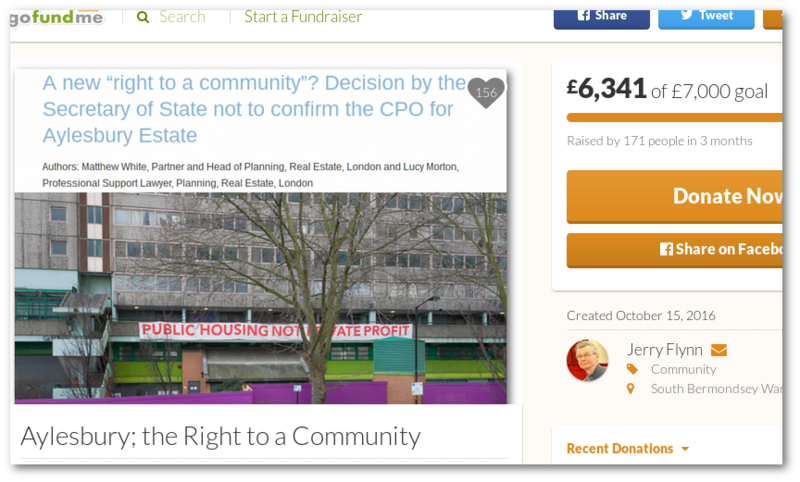 The 35% Campaign is committed to supporting the Aylesbury leaseholders and we have now raised over £6000 to ensure thay they are legally represented throughtout the whole CPO process; if you would like to help please click here - https://www.gofundme.com/aylesbury-the-right-to-a-community-2uefgf2s - all contributions, large or small gratefully recieved. Scott Morrison, Australia’s finance minister and possibly “next conservative prime minister”, has been led on a tour of the Heygate redevelopment. Australian developer Lendlease has been lobbying the Australian government in a bid to help solve the country’s deepening housing crisis, holding up its partnership with Southwark Council and redevelopment of the Heygate estate as a viable solution. Fortunately, we have been in touch with Australian National Broadcaster ABC and have filled them in with the true story behind Lendlease’s lobbying spin, i.e. that due to small print in the contractual agreement, the Council is unlikely to receive any profit when the scheme completes; and while 25% of the new homes will be ‘affordable’, shared ownership properties require a minium salary of £57,500 and only 82 out of the development’s 2,704 new homes will be for social rent. ABC published its report yesterday. Hopefully Australia can now learn from our mistakes rather than replicate them.